My fifteenth ground of 2015 was on Monday 31st August at Fetcham Grove in Leatherhead, Surrey. 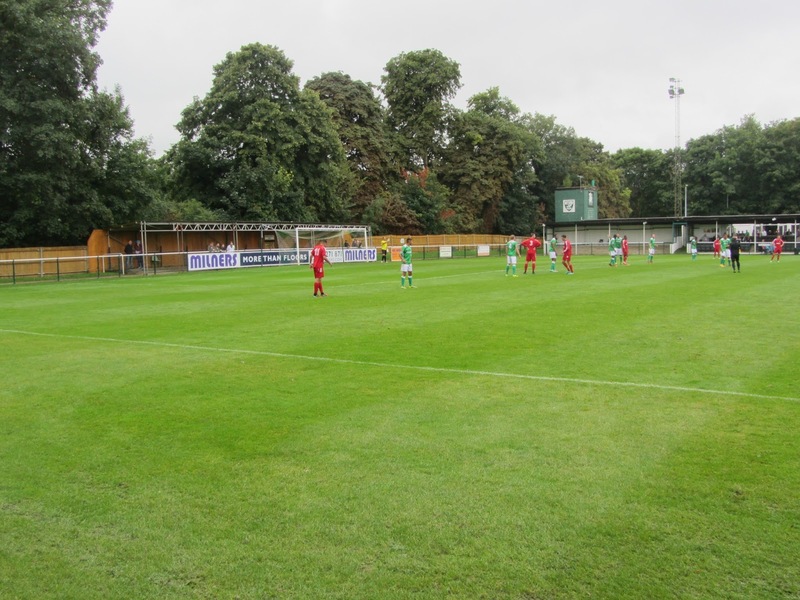 The match was Leatherhead vs. Merstham in the Isthmian League Premier Division. 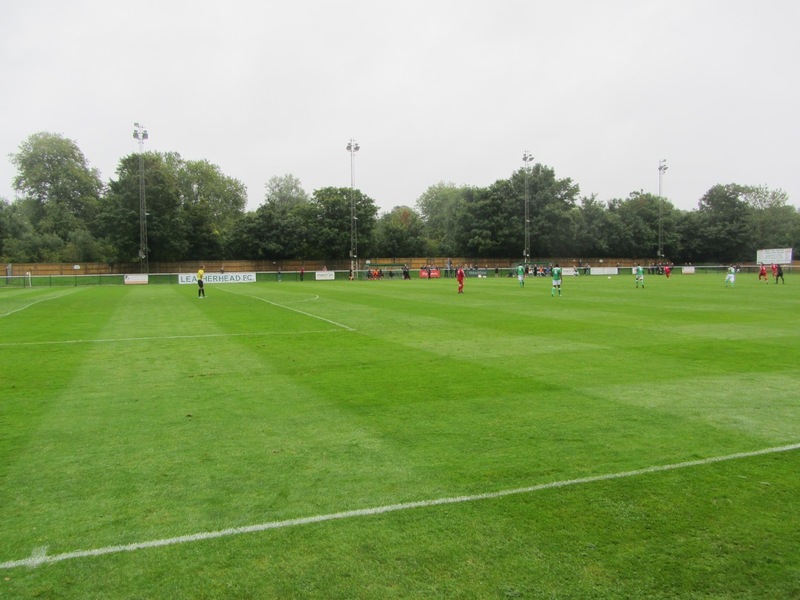 Fetcham Grove is located within a sports complex which includes a cricket club and leisure centre. The ground is half a mile south of Leatherhead railway station. The current incarnation of the club was formed in 1946 and they have played at Fetcham Grove since then - prior to this the venue was home to Leatherhead United. The south-west side of the ground is a mixture of seating and terracing but is all under cover. 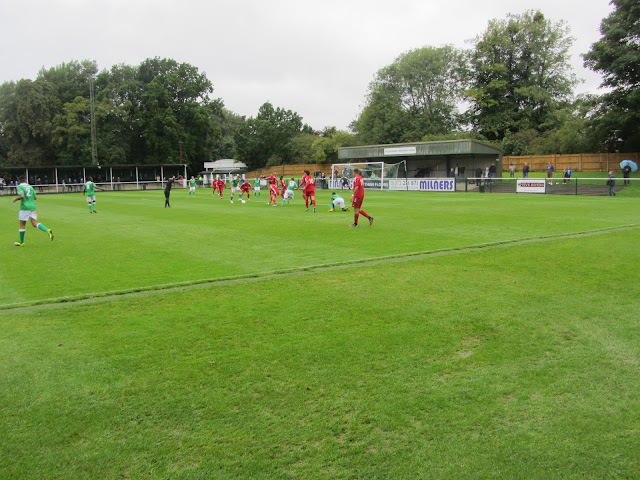 The seated area is placed in the middle with concrete terracing either side of it taking up most of this side of Fetcham Grove. There is a food outlet positioned in between the seating and the terracing towards the northern end of the ground and there is a club bar behind the terracing towards the southern end of the ground. The north-west side is taken up by uncovered hard standing with a grass bank behind it. The hard standing extends round to the south-eastern area which is the narrowest part of the ground. Behind the goal at this end is a covered standing area. There is a large grass bank behind the northern goal with concrete terracing towards the bottom of this. Part of the terracing is covered and this is known as the Bernard Edwards Stand. There was an energetic start to proceedings but the first real chance didn't come until the 27th minute when a Merstham header hit the crossbar. Five minutes after this Merstham did take the lead when a ball to the back post was pulled back for Wes Daly who drilled the ball in from 20 yards. In the 54th minute the visitors hit the woodwork again when a defence error saw Tommy Hutchings pick up the ball and try a terrific chip which came back off the inside of the post. 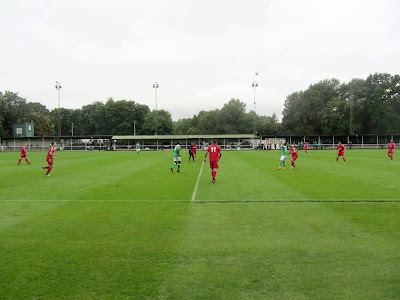 Hutchings continued to cause the home defence problems and in the 63rd minute he managed to burst through the defence before squaring for Fabio Saraiva to tap into an empty net. The closing stages were end-to-end and the home side almost made it a nervy finish for Merstham when a 40-yard lob came back off the crossbar with 10 minutes still to play. The away side survived the scare and saw out the rest of the game out to pick up a good win.